When traveling to Mexico, there are some things you just have to do. Eat all the tacos. Explore epic Mayan ruins. Stay in an all-inclusive resort and rage the swim up bar. And, of course, catch an evening of lucha libre. 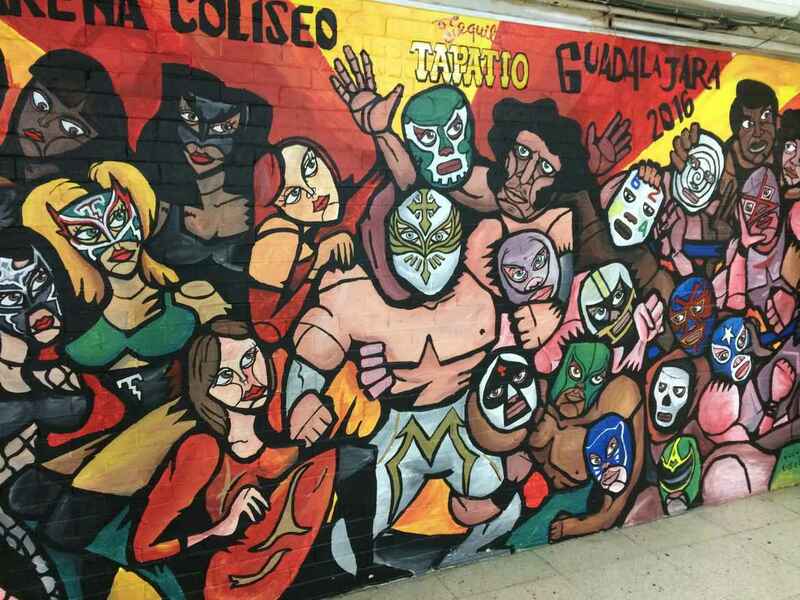 Here’s a brief introduction to the high-flying Mexican wrestling and some useful information about seeing lucha libre in Mexico. Inside the famous Arena Mexico. First and foremost, it’s important to point out that Mexican lucha libre is substantially different from American professional wrestling. As a lifelong fan of wrestling, I can easily spot the differences between the two. Whereas wrestling in the US tends to be somewhat of a soap opera for rednecks, lucha libre is far more focused on the action than the story. You won’t sit through 15-minute promos or constant interviews during a lucha libre show. The famous Mexican wrestling got its start back in 1863. A few Italian businessmen began promoting fights across the country and it grew in popularity. Salvador Lutteroth González is known as the father of lucha libre, having started the Empresa Mexicana de Lucha Libre (Mexican Wrestling Organization) in 1933. It’s now called Consejo Mundial de Lucha Libre (World Wrestling Council, and it’s still going strong. Lucha libre means “free fight” in Spanish, which makes sense once you watch a match. You won’t see moves like choke slams and power bombs, but you will see plenty of high-flying maneuvers. Unlike pro wrestling in the US, lucha libre bouts are usually 2 out of 3 falls. Most matches are between tag teams, with 2-on-2, 3-on-3, and even 4-on-4. The most important part of lucha libre! The most recognizable element of lucha libre is without a doubt the colorful masks that wrestlers wear. While a majority of wrestlers don a mask, there are plenty who don’t. Masks come in all different styles and colors, and they’re definitely a point of pride for the wrestlers who wear them. The unmasking of a wrestler is a big deal, and it happens to most at some point in their career. It’s very common to see a mask vs. mask bout, where the loser will have their mask removed. In normal matches, the rudos (bad guys) will always try to take off the mask of the técnicos (good guys). When attending a match, you can shop for hundreds of different styles of masks from street vendors outside the arena. A major reason why lucha libre is a cultural phenomenon in Mexico is a former wrestler named El Santo (The Saint). He made his debut way back in 1942, winning an 8-man battle royal and the hearts of the audience with his bright silver mask. His real name was Rodolfo Guzmán Huerta, and he went on to have a career spanning five decades. El Santo became a real-life superhero for his fans. In addition to wrestling, he was in several movies and comic books. His mask never came off in public until one week after his retirement, when he removed it on national television. One week later, he died from a heart attack. El Santo was buried with his mask on, according to his wishes. His son continues to honor his legacy, wrestling as El Hijo del Santo (The Son of the Saint). Your best bet for catching an evening of lucha libre in Mexico is in the country’s two biggest cities – Guadalajara and Mexico City. Both cities have CMLL shows several nights a week. Here’s a guide to seeing lucha libre in each city. Outside the arena and the card for the night. In DF, lucha libre shows happen on Tuesday (7:30), Friday (8:30), and Sunday (5:00) at the 17,000-seat Arena Mexico. Not surprisingly, the Friday night fights are the most popular and draw the biggest crowd. If you really want to soak up the atmosphere, try to go on a Friday night. Tequila + cervesa = great pre-game! Outside of the arena, there are plenty of vendors selling masks, figures, and other souvenirs. There are also a bunch of street food vendors and bars in the area. We picked a local watering hole and enjoyed some massive beers and tequila shots before heading into the venue. Tickets can be purchased in advance through Ticketmaster, but are always available the day of at the box office as well. We splurged and went with front row seats, which only set us back about $20 each. You can’t even get nosebleed seats for that much at a WWE show! Front row seats for $20! Inside the arena, there are plenty of vendors wandering through the crowd with snacks and drinks. You can get doughnuts, chips, or cotton candy to munch on, as well as giant beers and micheladas. One massive cervesa only sets you back about $2, so go ahead and have a few! There are plenty of tours available that will get you to and from the venue and provide you with a ticket. It’s also quite easy to do all on your own. The arena is just a few minutes away from the Cuauhtémoc metro station, and every taxi driver in the city will know the place. Some say this is a sketchy part of town, but we felt totally safe getting ourselves there and home. Fights in GDL take place on Tuesday (8:45) and Sunday (6:00) at the Arena Coliseo. Unlike Mexico City, Tuesday is the big night here. That’s because the bigger names are fighting in the capital on Sundays, meaning you’ll only see local wrestlers that night. Ride the red bus to the show. Whereas you’re better off just doing it yourself in Mexico City, taking a tour is highly recommended in Guadalajara. This isn’t because of safety or anything – it’s perfectly fine to get yourself there – but the Red Pub offers an amazing tour on Tuesday nights. It includes a beer, your entrance ticket, and round-trip transport on their badass double-decker bus. The arena here is much smaller than the one in DF, but it’s still super rowdy. In fact, the fans with the cheap tickets are basically caged in because they get so wild! There’s seriously a fence separating the two sections of the arena. People up there go all out with the chanting. If you want to brush up on your Spanish curse words, this is definitely the place to do it. Half the fun of the Red Pub tour is the hilarious ride back. Everyone is a little loose after several of those massive beers, and the people on the top level have to constantly dodge trees while the bus zips through the streets. You can keep the party going back at the bar, or you’re just a short walk from one of the city’s major nightlife districts. After calling this great country home for the past half a year, I can easily say that seeing lucha libre in Mexico has been one of the highlights of our time here. Even Rachel – who constantly makes fun of me for my love of wrestling – had a great time and would go back again. If you’re traveling in Mexico City or Guadalajara, be sure to set aside a night to join the rowdy crowd in the arena. Wrestling fan or not, you’re sure to have a good time. Have you seen lucha libre in Mexico? What did you think? Leave a comment and let us know!